(Seychelles News Agency) - Seychelles on Monday launched the world’s first sovereign blue bond, a financial instrument designed to support sustainable marine and fisheries projects, said a communiqué from the World Bank Group. The blue bond, valued at $15 million over 10 years with guarantees from the World Bank and the Global Environment Facility, is to support the Seychelles’ transition to sustainable fisheries. As one of the world’s biodiversity hotspots, Seychelles with an Exclusive Economic Zone of 1.4 million square kilometres, is balancing the need to both develop economically and protect its natural endowment. 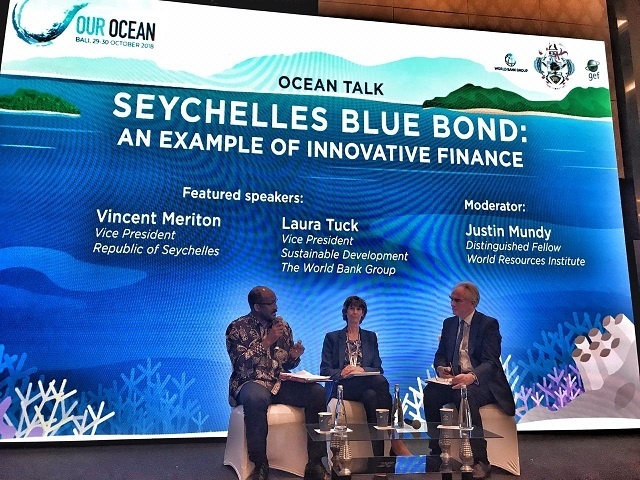 Speaking at the launching of the bond at the ‘Our Ocean’ conference in Bali, Indonesia, the Vice President, Vincent Meriton said that Seychelles is honoured to be the first nation to pioneer such a novel financing instrument. “The blue bond, which is part of an initiative that combines public and private investment to mobilise resources for empowering local communities and businesses, will greatly assist Seychelles in achieving a transition to sustainable fisheries and safeguarding our oceans while we sustainably develop our blue economy,” added Meriton. Proceeds from the bond will be used to support the expansion of marine protected areas, improved governance of priority fisheries and the development of the Seychelles’ blue economy. Grants and loans will also be provided through the Blue Grants Fund and Blue Investment Fund, managed by the Seychelles’ Conservation and Climate Adaptation Trust (SeyCCAT) and the Development Bank of Seychelles. Seychelles, an archipelago in the western Indian Ocean, was assisted in developing the Blue Bond by the World Bank by reaching out to the three investors -- Calvert Impact Capital, Nuveen and Prudential. The Seychelles blue bond is partially guaranteed by a $5 million guarantee from the World Bank and further supported by a $5 million concessional loan from the Global Environment Fund which will partially cover interest payments for the bond. Proceeds from the bond will also contribute to the World Bank’s South West Indian Ocean Fisheries Governance and Shared Growth Programme, which supports countries in the region to sustainably manage their fisheries resources and increase economic benefits from their fisheries sectors.